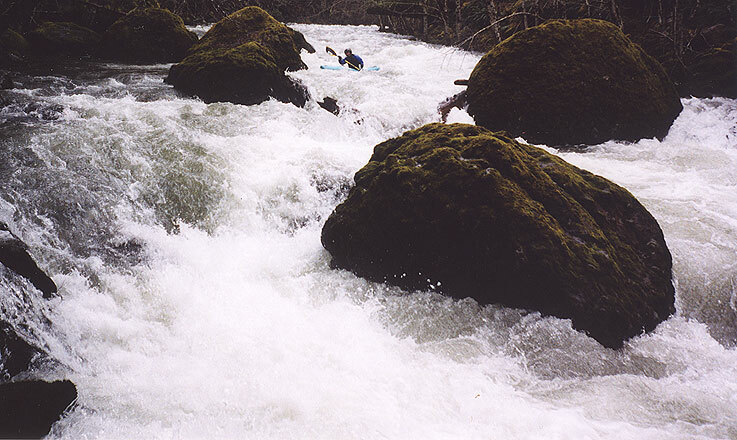 Copyright © 2003,2009, Oregon Kayaking. No part of this page may be reproduced, linked, or copied without the express written permission of the Oregon Kayaking webmaster. It should be noted that I last ran this section in spring 2009, and there were no log portages at that time. The Table Rock Fork is a great class three run, very continuous and entertaining. It is something of a mystery to me why this run hasn't gained popularity with local paddlers, but I think this will change as more people start venturing up there and word gets around. I first heard about the Table Rock Fork back in the nineties, when Dan Coyle and John Cliff ventured up very high on the river and ran the whole thing down through Table Rock Gorge ( actually, I think Dan was the only one to run the gorge, and at pretty high water, if I remember correctly ). Dan and John reported several significant class IV-V rapids up high, then the middle class III-IV section described in this report, then the gorge at the end. Most people run the middle section, avoiding the claustrophobic gorge downstream and the wood-filled big drops upstream. At the recommended flows ( 3,000 - 8,000 on the Molalla at Canby ) this run is very busy, with nearly non-stop splashy drops all the way to the take out. There is only one rapid which is in the class four range in my opinion, but there is plenty of fun stuff in between when the water is up. Its like this for five miles, when the water is up. Flow: 4,000 cfs on the Mollala at Canby gauge. The biggest rapid on the run is known as 'The Pinch' and is located about a mile below the put-in. 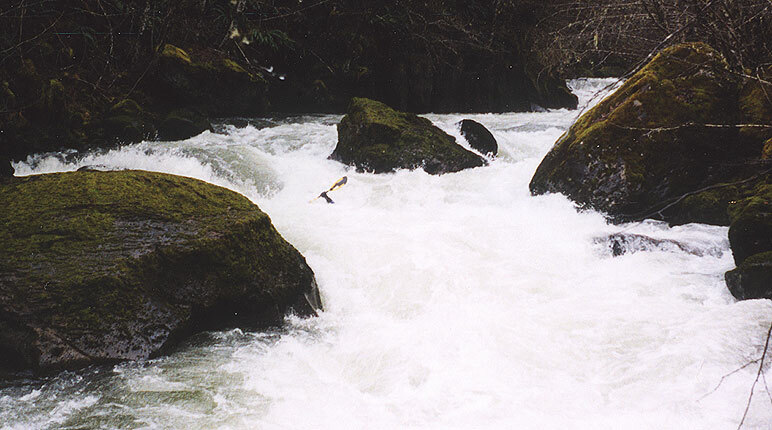 This three-part drop is easily recognized from above, just look for a narrowing and large boulders in the river. 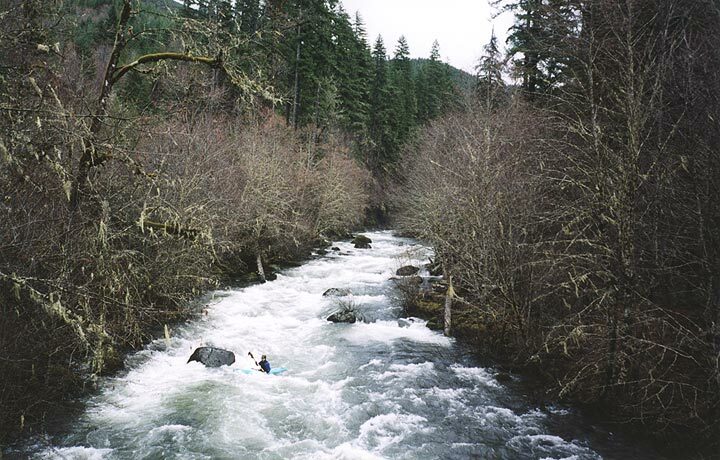 There is a big eddy on the river-right side immediately above the drop, so it is pretty easy to scout on that side. Portaging is easiest on the left, however, so if you have any doubts about running this drop catch an eddy on that side. Anyone swimming above The Pinch should make an extra effort to get out of the river; this drop has several features that would be quite dangerous for a swimmer. The logs pictured below are no longer blocking the center line, which is good. Generally, you don't want to run the right-side line in the entrance that Pete was forced to take below, because the actual 'Pinch' ( not pictured ) tends to flip you if you start too far right. The best line is to come right down the middle of the river on the entrance slalom between the boulders, pretty much where the log is blocking the flow in the pictures below ( the exact center of the photo below ). This gives you more momentum for the 'pinch' itself, which has a large diagonal that flips lots of people. If you do flip in the pinch, you have to hit a very fast roll before you go over the final drop! I suppose I should get a photo of the actual 'pinch' up here sometime.. The entrance slalom on the Pinch. The actual 'Pinch' is located just downstream.. I don't have a photo of it. The final drop in The Pinch is a uniform hole that is surprisingly sticky at higher flows. In fact, the line at higher water pretty much involves side-surfing the hole over to the river-left side, then paddling out over there. Pretty fun stuff! Note: The far river-right side of the bottom drop pours onto a boulder with severe pinning potential (see photo below). Because of this, tentative class four boaters will want to scout carefully before attempting this drop. Pete does the usual involuntary side-surf in the bottom hole in The Pinch.. Yee Haw! Below The Pinch the river resumes its ultra-continuous nature as it winds its way down to the take-out. I highly recommend this run paddlers looking for something new in the Mollala drainage. It is much more continuous than the Three Bears run just downstream, though the little gorges on the Three Bears run probably make it a little more scenic overall. FLOWS and ACCESS: This river is best after a heavy rain storm. The only gauge that we use currently for this run is the mollala River at Canby, which provides a fairly strong correlation for this run. 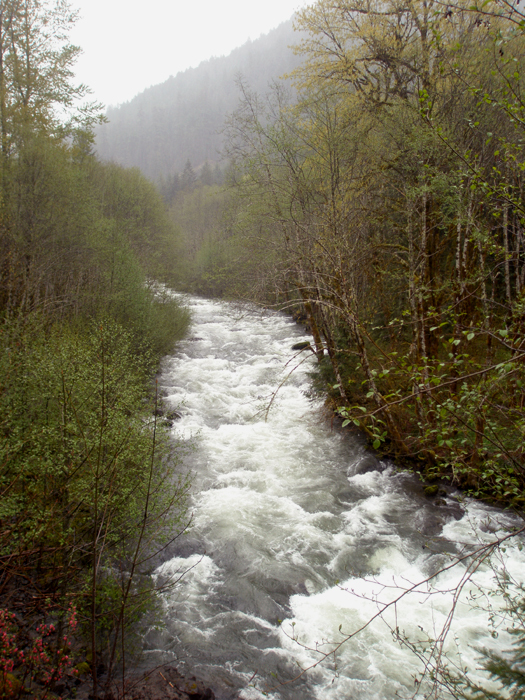 The Table Rock Fork usually contains about 10% of the water of the mollala River at Canby. Minimum recommended flow is 3,000 cfs on the Mollala River at Canby internet gauge. 4000-5000 is optimal, a fun medium flow. 7,000 cfs and up is medium-high, and it really starts to push in there, and the Pinch gets chunky. Prior knowledge of the run is recommended before you run it much above 7,000 cfs. Also, a note for those not interested in running the Pinch: Portaging the Pinch is easiest if you eddy out on the left hand side. If you go for the larger scouting eddy on the right, portaging becomes much more difficult and somewhat dangerous due to the steep, crumbly walls. To reach the take-out, drive 4.4 miles upstream from Turner Bridge and then take a left. The road will go up a hill, then top out. You can scout the gorge from here, if you want to. Continue upstream to a very large gravel parking area on the right, next to the river. This is the take out. There is a logjam just downstream, it is easy to identify this spot. Note: The short gorge just downstream of the take-out is class IV-V and should be approached with caution. It is easy to locate the gorge, you can stop on the shuttle when the road peaks out and peer down inside, but be advised: the biggest drop is hidden just downstream. To reach the put-in, drive about five miles upstream, crossing a bridge along the way, to where a gated bridge crosses the river on a small, narrow side road on the right hand side. The gate and put in bridge is visible from the main road. Be sure to park on the main road so you don't block the road and create access problems for those who come later. From the main road it is a short walk ( a couple hundred feet ) to the put in brige. We had about 7000 cfs in the mollala River at Canby gauge on the day the photos were taken for this trip report, except for the first image, which was taken at 4,000 cfs.